Jerry Brown’s no-frills inauguration today as California governor will make headlines, but the meager celebration also marks the restoration of one of the country’s most illustrious political families. Save the Kennedys of Massachusetts no clan has dominated the political life of a major state in modern times than the Browns of California. A member of this old California Irish clan has been in statewide office for most of the past half century; by the end of Jerry Brown’s new term, his third, the family will have inhabited the California chief executive office for a remarkable two full decades since 1958. Brown, at 72 the oldest governor in state history, may well determine the final legacy of this remarkable family. His biggest challenge will be to reverse the state’s long-term secular decline — a stark contrast to the heady days of the first Brown era, presided over by paterfamilias Edmund “Pat” Brown. Under Pat roughly 20% of the state budget was devoted to capital outlays. He expanded wealth creating infrastructure such as freeways and the State Water Project, which created vast expanses of new, highly fertile farmland. He also increased the state’s parklands so that middle-class Californians could enjoy the state’s unmatched natural beauty. Pat, as historian Kevin Starr notes, also transformed California into “a mecca for education.” Inexpensive and quality training — from the elite university to the extensive network of community colleges — fostered high-tech industries across the state. Under Pat Brown, California’s share of the nation’s employment rose from some 8% to 10% as its GDP swelled by a similar percent. Pat, not surprisingly, remains an iconic figure for many older Californians. What ended his career was not so much his embrace of big government — although its growing scope and cost concerned many voters – but backlash against the 1964 “free speech” riots at Berkeley and the far deadlier civil unrest in Watts the following year. Running as the candidate of law and order, as well as fiscal conservatism, Ronald Reagan in 1966 defeated Brown’s bid for a third term. Jerry Brown turned out to be of a very different political hue than his father. Sometimes he sounded more anti-government even than Reagan. 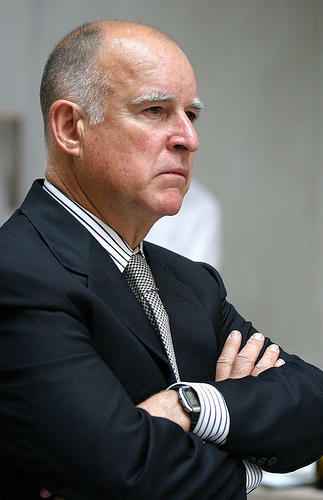 He disdained his father’s traditional focus on infrastructure spending and instead preached about amore environmentally friendly “era of limits.” Brown cut the percentage of spending on such capital improvements from roughly 10% of state spending under Reagan to barely 5%, where it remains mired today. Arguably Brown’s biggest mistake was signing legislation in 1978 that allowed collective bargaining for public employee unions. This opened the door for a power grab that eventually drove the state toward semi-permanent penury. Brown’s early embrace of environmentalism also set a pattern of state green engineering that, although clearly avant garde , also tipped the state’s competitive edge. Brown, however, also showed a pragmatic side. Although initially opposed to Howard Jarvis’ 1978 Proposition 13 limits on property taxes, he later embraced it so enthusiastically that the casual voter might have mistaken him for its author. In his second term Brown also evolved into an avid cheerleader for the state’s burgeoning high-tech industry. He also had good fortune to govern California at a time when surging Japanese investment, the high tech boom and, perhaps most important of all, the military buildup accelerated by the 1979 Soviet invasion of Afghanistan generated a remarkable economic boom. Between 1976 and 1980 aerospace and electronics-related employment jumped by a third. California’s share of the nation’s GDP, population and jobs rose steadily, while job growth surpassed the national average. The third Brown era, sadly, starts with far less favorable prospects. The state’s share of the nation’s economy and employment has been shrinking for at least a decade. Per capita income has fallen in comparison with the national average by nearly 20%. Once the nation’s high tech wunderkind, California’s share of new high-tech jobs has fallen to a fraction of the national average, while other states, notably Texas, Virginia, Utah and Washington have surged ahead. Things have been toughest on the state’s working class. Despite an ever-expanding welfare state, California’s 36 million people suffer a rate of poverty at least one-third higher than the national average when adjusted for cost of living. Unemployment now is higher than any major state outside Michigan. Meanwhile, even as state social spending has surged, reminders of the heroic period — from the state system of higher education to the power, water and freeway systems — have fallen into disrepair. The state’s finances are in even worse shape. Under the feckless Arnold Schwarzenegger, state debt jumped from $34 billion to $88 billion. California now spends twice as much on servicing its interest (more than $6 billion annually) than on the University of California. Brown himself recently conceded that the state budget deficit may widen to $28 billion over the next 18 months while the state’s Legislative Analyst’s Office predicts that $20 billion deficits are likely to persist at least through 2016. Not surprisingly, once golden California suffers consistently near the worst debt rating of any state. And things are not likely to turn around quickly: State and local tax revenues in the third quarter of last year rose a paltry 0.6% compared with a 5.2 % gain nationwide. Brown’s proven taste for austerity could make him far more effective at addressing the state fiscal crisis than the clueless Terminator. His biggest problem on fiscal matters, one close advisor confided, may lie with his own Democrats in the legislature, many of whom are little more than satraps of the public employee interests. Brown’s support for the state’s increasingly draconian green polices may prove more problematic. As Attorney General, Brown played the bully in enforcing radical green measures that seek to limit developments — industrial and residential — suspected of creating greenhouses gases. Brown suggested during the campaign that such policies would help create an estimated 500,000 green jobs, but few outside the environmental lobby take this seriously. Brownsupporter Tom Hayden points out that these jobs can only be created by higher energy prices and considerable tax increases — not exactly the elixir for an already weak economy. More troubling still, Brown, the Democratic leadership and their media supporters continue to deny that “progressive” policies have created ”a hostile business climate.” Until they wake up to the reality of the state’s dire economic situation, little in the way of serious reform can be expected. To succeed, Brown must move beyond delusions and rediscover the pro-business pragmatism that characterized his second gubernatorial term. If not, we can expect the final obliteration of Pat Brown’s great legacy of pro-growth progressivism, in no small part due to the misjudgments of his son and heir. Submitted by david watson on Sat, 06/06/2015 - 07:30. Submitted by david watson on Thu, 05/07/2015 - 15:36. Submitted by zac1 on Wed, 05/06/2015 - 08:18. Submitted by johnz308 on Fri, 05/01/2015 - 15:40. Submitted by xijozx1122 on Sat, 04/25/2015 - 07:05. Submitted by david watson on Wed, 04/22/2015 - 07:12. Submitted by xahgzr1122 on Sat, 04/11/2015 - 08:16. Submitted by johnz308 on Thu, 04/09/2015 - 14:47.